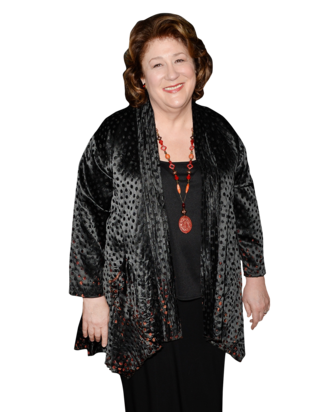 Meryl Streep and Julia Roberts might get a lot of the accolades for August: Osage County, but Margo Martindale deserves some love, too. Throughout most of the movie, she’s harping on her son Little Charles (played by Benedict Cumberbatch with sweet clumsiness), and the edge in her voice is enough to dismiss him as a disappointment. And, without giving too much away (although those who’ve seen or read the play know what’s coming), her character reveals something later in the film that allows for you to rethink Martindale’s entire performance. It’s quite a memorable story line. We spoke with Martindale about drinking with class, her “juicy” return to The Americans, and potluck dinners with Meryl Streep. Your character has the line, when her husband is drinking a beer, about how she’s drinking a cocktail. Her drink has class. Scotch has class. But it’s not anything I would drink unless I had to, unless my throat just can’t stand whiskey. Wine has class. I love wine. The drier, the better. But beer? I just can’t do it. Apparently when you were shooting the massive dinner and fight scene, you were actually sick, and drinking whiskey got you through it? Just about this much [holds up two fingers] to stop me from having a coughing jag. [Laughs.] Meryl was smoking, for her character, but she was so great. She would say, “Get a fan over here! Get it out of Margo’s face!” She’s wonderful. She looks out for every detail. We worked on that scene so much. We had a potluck dinner at Meryl’s, and we sat in the seats sort of where we would be sitting, and passed food, and did the lines, just so we would all be prepared. Anywhere we stopped, started, went, we would know where we are. So everybody was incredibly prepared, and it sort of seamlessly came together. What did you bring to the potluck dinner? I made a chicken-spaghetti casserole, turkey chili, and a buttermilk pie. It’s just sugar, butter, eggs, vanilla, and buttermilk. And it is outrageous. It’s Southern, it’s Texas, Oklahoma. All the food I made was appropriate for the movie. Look up buttermilk pie. It’s so good. It’s drippingly sweet. You could eat this much [indicates a thin sliver] and be satisfied. I don’t cook as much as I used to, but it’s very therapeutic. Meryl cooked. She would be like, “Come over! I’m making this.” “Come over! I’m making that.” She can cook. Oh my goodness. She can cook anything. She’s Meryl Streep! [Laughs.] Think about it. She has an enormously large family, and she cooks breakfast for all of them. Usually it’s like twelve people there. She cooks for everybody. I think it’s one of her joys. I’m speaking out of school, but she seems to really love it. She made these incredible, incredible small lamb chops, like I’ve never tasted before. Unbelievable salads. Since you’re playing Benedict Cumberbatch’s mom, did anyone ever tell you about the Cumberbitches? I’ve heard about them! I think [director] John Wells told me about them, yes, yes. Would you now consider yourself a Cumberbitch? [Delighted.] Yes! I think I would! [Laughs heartily, claps.] He’s a doll, isn’t he? He’s a doll. He’s very versatile. I think he can morph pretty good. I understand his audition, he did a selfie on a cell phone, and sent it in to John Wells. Pretty good, huh? “Look, I can do this!” And he’s got a beautiful voice. I think he worked really hard on that song [in the movie]. He can sing. Lovely, sweet voice. And I had no idea — no idea! — that he was a heartthrob. [Laughs.] He is, though, isn’t he? It was so comfortable. I knew that we could be sexual and flirty and we could just go anywhere, because it was safe. It was a joy and I felt like we really seemed like a married couple. It felt really good to me. It felt real to me. I was talking to Keri Russell recently, and she mentioned that she was going to steal you back for The Americans. She had gotten into a little bit of a spat with Will Arnett over it. [Laughs] I know! I think they had a fight! That’s so cute. And she must have won, because you’re back for at least one episode? I am! [Waves episode script.] I am, tomorrow! That’s what these lines are for! [Laughs.] I’ve been working on them. I shot on Friday night in Los Angeles [for The Millers], and then I flew out here on Saturday, and I started on the plane. And it’s very juicy! [Laughs, then turns script over.] Claudia is such an interesting character. She’s grown on me. I mean, I love this show. I think it’s magnificent. But the challenge in it is the speech pattern. I was trying to do something different, and I think I succeeded. But there are lots of secrets to unravel. Which is why you should do more than one episode. Who knows? We’ll see how it works out with the two networks. Will Arnett and Keri Russell need to learn how to share. They do, they do! [Laughs.] Look, it was a terrible timing issue, between The Americans and this thing. I had no idea what was going to happen to Claudia, and I didn’t get any indication. And my thing is usually to keep working. So that’s what I did [by signing on for The Millers], and then they tell me. “What? !” But I actually told them and it slipped through the … the timing was bad, on both of our parts. That’s all. [Showrunners] Joe [Weisberg] and Joel [Fields] and I talk all the time now. In a way, Claudia is like your character in August, because she’s the one holding the secrets. And the fact that Mattie Fae has kept a secret for all of her life, I mean, for many, many, many years, is very similar to that. And that’s an interesting thing to play … very fun.